She is 100% correct on the analysis. She comes pretty close on the prescription as well. After reading her last review of the latest Gnome (which was very positive) I was somewhat interested to see what she would say about KDE. Most of here previous articles reviewing KDE were scathing. I kind of expected the same for this. However, that is not what I read. My synopsis of her article is that she does actually like KDE and would love it if it could symplify the last front of configuration. I didn't think I would ever hear her say something as good and as positive about KDE as this article does. I agree completely with her assessment of Plastic. It is a beautiful theme. I agree that we shouldn't change styles mid major release. I also know though, that I used keramik for 3 days before going back to Mandrake Galaxy (I do still use the keramik window decoration). I will use Plastic once I switch to 3.2 full time. I agree that having four text editors from the same desktop in the same menu is probably too much, although having two is not unreasonable. Quick poll - how many people use the menus to access the text editor, how many use a konsole to start them, how many use "Alt-F2 kwrite" to start them, how many have a dedicated global key shortcut?. The same developers who care that we have four text editors probably don't use the menus to start them. I agree that we need better configuration dialogs. Understand though, that when I first load a desktop environment, the first thing I do is go through every configuration option I can find to see what range of options are available. Same with applications such as konqueror, kopete, and any other application (usually I use an application for a few moments before diving in to see what extra options are available). I love the number of options that KDE has. I don't really want them to go away. However, I would like it if they were a little bit easier to follow for the simple options. KDE is at the point especially with 3.2 that I would install it on my mom's computer. My immediate family has used it for sometime - but it is usable enough for my mother, dad, fill in any name here. That is until they need to change a configuration item. Beginners really need to have only the pertinent options presented in a simple and concise manner. Period (ok - maybe not period - but I would offer a challenge to find any research other than personal observation that would suggest that showing more items at a time is easier to grasp than showing only a few items). I don't know the best way to keep all of the advanced items - we shouldn't get rid of them. But we really should only present the default simple options to the new user - even if that new user uses the configuration only once in awhile. I agree that there shouldn't be so many options under the "Settings" menu (Configure shortcuts, Configure toolbars, Configure konqueror, Configure spell checker). The options seem redundant, even if they aren't. They probably ought to be merged into one "Settings" sub menu item like she suggested. With shortcuts, toolbars, and spellchecker listed as components in the konqueror configuration dialog. I often choose the wrong "Configure" sub menu item and I'm sure many other people would agree that they have choosen the wrong item at least once. Finally, I agree on the context menus. I like that they have gotten better. However, some options could use better explanation and could be collapsed. For example, I love Quanta - but I don't think it should be on the main context menu. The "Preview In" submenu is a little bit misnamed and the options in preview ("Embedded Advanced Text Editor" and "Embedded Vim Component") are a little bit over the top for most users. It would be much better to have an "Open with" sub menu that contained quanta, and the different editors. I like the gnome idea for the "Open" items on context menus (Show the main mime handler and then a submenu of other handlers - Although if you are using the application that is the main mime handler to get the context menu - you probably shouldn't show that application in the context menu). Any way - I've rambled on. I think she is 100% correct. She seemed to have nothing but praise for the latest work and the speed and the framework and seemed to just be screaming to finally fix one of the last perceived sore spots of the KDE desktop (configuration is such a sore spot that any 3 developers would give 5 opinions about how to do it). In 3.2? right-click the input and select check spelling... from the context menu. Euigenia concludes that it's easier to use KDE's good application framework and polish the apps, than it is to extend Gnome's framework to KDE's levels. It made me kinda optimistic to see her give KDE that recognition. I certainly didn't expect it! It may sound like cursing in the middle of a church, but... why exactly do people want KDE to be usable/understandable/acceptable for any Joe User? I see a lot of comments here and on other places that people thing that Joe User won't be able to understand all the options, that he will be scared away, etc. So what? If Joe isn't willing to spend some time learning KDE, or feels happier using GNOME or even windows, why exactly do we care? Isn't there a place for a DE that fits the needs of 'advanced' users who actually *like* this so-called 'clutter'? I think in the end, it's not Joe User who helps to move KDE forward for us all. It is the advanced users who do, who take their time filing usefull bugreports, or even fix problems themselves. It is they who come up with suggestions for new applications or features that help the current userbase. 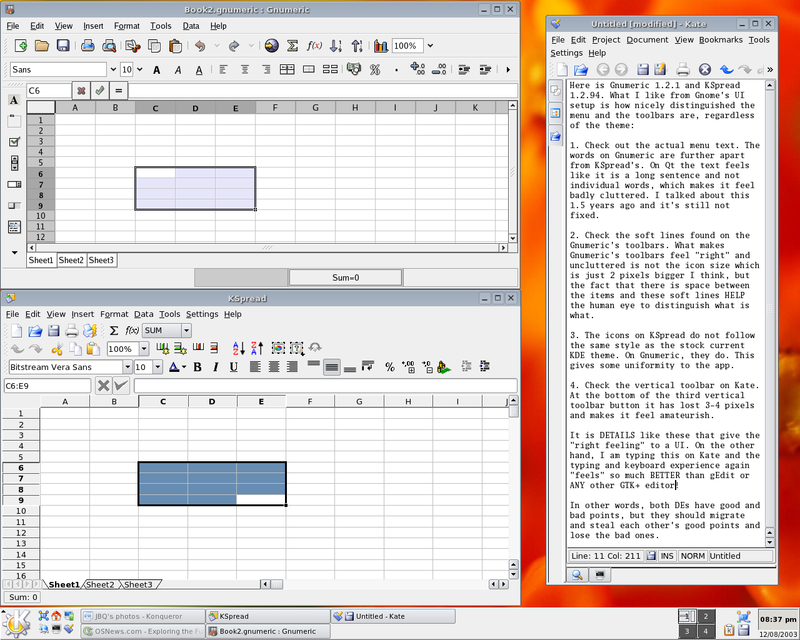 Really, can anybody explain to me what exactly is the benefit of KDE conquering Joe Users desktop? True. Joe User will not help to advance anything directly. But I would imagine that most of the people using Linux are hoping for the day when a multitude of Joe Users who are using Linux will have enough mass to bring about a slew of software for Linux. Yes, we can continue to write software to fill all of our itches and avoid all proprietary systems like the plague, but at some time we will want to use a niche program by a company writing software for that niche - and we won't want to take the weeks or possibly months or possibly years to develop it ourselves (as an example I would really love to have some Garmin GPS software that works under Linux). We can write companies, we can lobby. We can yell at them. We can ignore them. Companies using a non-free software model, who still write useful software that we may actually want to use, will not listen until there is enough demand. That demand can be inspired by a host of Joe Users. Joe by himself is not very loud. This would be the proverbial Chicken and Egg problem of applications for Linux. Well, I do understand your argument, but I don't think that the lure of commercial niche software somewhere on the horizon is worth sacraficing features ('bloat' as others call it) people use _now_. I think KDE has enough critical mass as it is, and is still gaining momentum without these sacrafices. Very cool on the KFLog stuff. I had downloaded and worked with it a bit. Very nice. However the maps don't always have as great a degree of detail that I can get in the Garmin maps. I know there are ways to digitize maps but they aren't exactly user friendly. Then, trying to get the map into a garmin format and downloaded to the GPS is even more difficult. I wish Garmin was a bit more open in this regard. On the other note. I am not calling for the removal of features (Especially not in any of my posts in this topic). But the configuration of KDE needs to be made easier - however it is done. Why does it need to be made easier? Why not - and what would it hurt? Is there a maximum level we take it to? Certainly. Do I have much room to talk about KDE development? Not much as I haven't contributed to the code base as of yet - but some because I have some experience using it. I don't know how to get the maps into the Garmin. I'm sorry. It's not in the interface specs I have at my disposal. If all we are doing this for is for ourselves, aren't we a sorry bunch. Are you a sorry individual if you sell something trying to earn money for yourself? Are you a sorry individual if you have a hobby that is "just for yourself"? You are not just wrong, you are incredibly, what-a-heckishly wrong. Yes? You're helping to supply their livelihood. No? Do you plan on having a family? Yes? You're preparing for them. No? Are you just trying to survive? Yes? I'm sorry for you. No? I'm sorry for you. Wanting to earn money for myself is not bad as a means. But as an ends it is pretty hollow. On the topic of a hobby. I agree that there are some things that we may do that appear to be only for ourselves that bring us levels of satisfaction - such as coin collecting, or painting, or hiking, or developing software. But if I spend my life in that hobby, or put time away into it, or cherish it, or all three, and not ever share it with another person - I would evaluate that as being pretty sorry. However, the chance of a hobby ever being truly just for yourself is pretty slim - as even your posterity or the history books will look on your life and will remember that hobby and will see it with either admiration or pity. And if the hobby isn't self fulfilling or is destructive in nature - well I'm sorry for that too. Doing something extra for the simple sake of doing something right may be thought to only serve self, but really is of benefit to humanity. In effect, anything good you do - whether intentional or not will affect somebody else. Any thing bad, likewise. Do I do things or have hobbies that are "just for myself?" Of course. But the more I look at those hobbies and the missed time I could have been with a loved one - the sorrier I am. The application of the term "sorry" is open for interpretation. Am I offbase? Probably, but I have found ways to avoid being sorry later on. Do I have a family? Girlfriend, she makes about the same money I do. I find your post stupid and smarmy. All touchy-feely new-agey and bland. I feel sorry for you if you really are like that. I'm often stupid and I'm sure I'm often smarmy. When I am old and sitting on my porch with my wife and the kids have moved away and I have a moment, I imagine I'll reflect on how smarmy I've been - but I probably won't be sorry. The sole thought of devolving into that line of thought makes me want to become a Soylent Green advertiser. There are many many many selfish people who are married, and they will be healthier and have better porches than you. And if I worry about the grass on the other side of the fence - well - once again I'm a pretty sorry guy - which is what this little thread started with anyway. > person - I would evaluate that as being pretty sorry. But KDE is open for all to share. It's not a coin collection that is kept in a safe and is never seen by anyone but the collector. Thousands of people who have never contributed to the project -- myself included -- have benefitted from it. Just because IBM and Sun aren't trying to cram a customized KDE down our throats doesn't make KDE a failure. The fact that is't shared doesn't mean it's done for the people you share it with. No we are not, even if we were doing it all for ourselves. For my part, I'm doing it for people who'd like to contribute to the project themselves too. I think a lot of developers do. Didn't you notice the way developers are regulary demotivated by the demands from Joe User types? I did. I fear that will only get worse once the masses move in. I don't think the masses are ready to understand what Open Source is all about. I fear that may lay too big a strain on some projects, including KDE. I hate putting it in terms of Joe User, because its really not so simple. Sure, configuration clutter might be a "Joe User" issue, because you only configure once. But what about menu and toolbar clutter? That's not only confusing Joe, but its also slowing down Vladamir the uber-user. That's why a more streamlined KDE (to a point!) is better for everyone. Of course there are optimisations to be achieved, ways of interacting with KDE and it's applications to be streamlined, etc. I wasn't saying that KDE is finished or something like that, nor that we should not work on it or strive to be better. I was just wondering why some people are arguing that we should dumb-down KDE, hide options from the configurations panel, etc., just to please a Joe User. I know it can't be seen so black and white, but I was trying to raise a real question. The only argument I've seen so far, is that a larger userbase might attract companies that might supply niche products some users would like to use. For me, that simply isn't enough reason. Take a look at http://www.google.com/press/zeitgeist.html "Operating Systems Used to Access Google - Sept. 2003". Assuming that it is good measure of market share of Linux based workstations (and why it shouldn't be? ), when we move just 1% up, we would get twice as much users and supposedly much more software developers. There are many Linux projects which are severely understaffed (LyX, Debian, etc.). Currently, the vast majority of non-linux users aren't developers. While you are right that attracting more developers would be good, I don't see how attracting Joe User type of users is going to help here. I think it would sooner be counter-productive, as developers would need to spend more time in support and/or could be scared away by user demands from people who don't understand how OSS works. Compared to the amount of options in unix command line untilities, I have had no problem at all with KDE. old command line utilities suffer (I have also other things to remember). It is much easier to find an option through menus and if there are many of them those can be hidden in separate configuration menus or dialogs if it is a problem, I also like that I can configure the look and feel just I like. And I hope that there will be plenty well supported applications, There are still many I miss, one does not have to install those that one does not like. Keramik in my opinion is more nice looking than plastik. No doubt, the Control Center holds an enormous amounts of options. For a moment, lets take a look at what options in there that are most essential to be able to change. I may have missed some, but I find that the vast amount of options do not belong to the "most essential" category. Since KDE in itself does not configure all aspects of the OS, there are not so many really essential settings there. Many, many settings are of the power-user flavor though. Would it perhaps be a good idea to design an alternative, much simpler control center with only very basic options? I suspect it is both simpler and less likely would lead to flamewars. This alternative control center should be "mom-proof". How would such a control center look? Lets not at the moment argue whether it is a good idea to have two control centers. Let's just pretend it is a good idea. How would it look? What would it contain? What are the really essential options, how can good defaults be destilled down to a minimal set of settings, for those who don't mess with settings unless there is an emergency? > How would such a control center look? Actually, it would look just the same because the Control Center is just a container for KDE Control Modules. You could have a Basic and an Advanced Control Center and the Basic one would not have all of the modules available in it. But, to do what you appear to want, it would be necessary to have two versions of the KCMs as well. ok, i just loaded kde 3.1.94 (cvs >=20031206) and one of the most irritating things from the windows world has crept into kde, and i can't figure out how to turn it off! whenever a new window opens up, the taskbar flashes the new windows entry 3 times in blue before just staying there in blue until you click on it. i hate this. i have had to remove the taskbar until it can be fixed. if anyone can help me turn this %$#@*& off i would appreciate it immensely. I think you need to go to the KDE Control Center then select: Desktop->Window Behavior, then select the Advanced tab and adjust the "Focus Stealing Prevention Level:" to a lower setting. that's really a shame that you have to disable focus stealing prevention to get rid of the annoying flashing in the taskbar...maybe whoever coded that never used windows 98. What do those setting do? I don't quite know what to make of "extreme", "high", "low". hese are the kind of articles I love readinga t OSNEWS.COM. Criticisms with constructive suggestions, and many of the things mentioned would probably not be ramarked by anyone but Eugenia. Such as teh menu and toolbar separation, msot would just say it's cluttered and leave it at that. I agree with just about al of Eugenia's points, but I do wishs he went intoa lot more details regarding teh new features in this release, there are hundreds of new important features. Also, I don't think Kcontrol is that bad, it does have too many options ins ome areas, but waht is more problematic is that they are not as well organized as they should be. Lots should be combined, sucha s Keyboards and Mice. But overall I think it is a very good ocntrol center and just needs a bit more polishing. If you don't wan to change the defaults you don't need to go in it. ALSO remember that unliek GNOME it has a very easy to use search tool. There is a find tab in which you can type what you're looking for and quickly find it. It works great even for obscure options. I often use it because it is faster that way. Good job to Eugenia and the KDE team, especially considering that there is still over a month until release. What I do think is that we should try think something up to link the different types of keyboard configurations together somehow. The current devision makes sence, but is confusing at the same time. Why do I need to configure keyboard repeat and numlock status in 'Peripherals' and keyboard layout and shortcuts in 'Regional & Accessebility'? Somehow, I'd expect keyboard configuration at one place. Having said that, I'd also expect Regional settings to be grouped like it is now... That won't be trivial to solve, I guess. I presume that who ever made this change thought that they were making an improvement. As, did whoever removed: "Edit File Type ..." from the Konqueror context menu and replaced it with a tiny unlabeled icon. Another "improvement": you now have to go to a second level menu to: "Mount" or "Eject" a CD-ROM while redundant options and options that simply don't work (with a CD-ROM) remain on the first level. Am I missing something here? Yes, I know, I don't understand Free Software -- he who codes decides, etc.. But, to me it is starting to look like this "he" isn't making very good decisions -- that design decisions need to be made before the code is changed. And yes, I brought this up on: 'kde-usability' -- an "arrogant developer" was nice enough to tell me how wrong I was without actually citing anything that had any validity. I have to agree with this. Hiding the unmount in an extra layer is positively silly. Is that a result of useability expertise? I'd just like to add a question (to my comments above). When I first came to Linux, around 1999 I guess, I was checking out the two DE's and I came to the conclusion that KDE was the average-user-friendly desktop whereas GNOME was the desktop for the more technically minded. It's strange how in the intervening four years that situation seems to have totally switched around, was this purely because GNOME got more commercial backing? Was it a conscious choice on behalf of the core developers? I use KDE for the last 5 years and it seems to me that it has grown to a point where there are just too many configuration options to keep them organised in the way they are know. I guess the KDE Control Centre is getting out of control. On the other hand keeping the functionality (and displaying it to the user) seems to be importand as well so there seems to be a need for two layers of configuration options. How does OS/X handle it?? A simple konfig menu to not freak out newbies with all the rest of the advanced options hidden away. I think the key to the configuration dialog complexity is to simply have an 'Advanced' option that expands out to show more features within the one dialog, Preferably integrating them into the layout to avoid duplication of catagories. The advanced options should also be destinctive, maybe a slightly different background color. and the desktop settings wizard can simply ask you if you want it on simple or advanced by default. Konqueror menus do need a good cleaning up. I think The Window menu could just about be gotten rid of. The Help menu should be moved to the far right (I sware it used to be in the old days). The go menu has alot of redundant cr*p in it such as applications autostart and templates. The toolbars should also be shrunk down, theyre a joke.. I mean print, print frame.. cut copy paste, 2 icons for view modes. Also reload and stop should alternate as they do in Opera as there is no need for both of them at once. Gnumerics toolbar DOES look better than on Kspread. If Kspread had those lines between the icons here and there it would look alot better. Also, it would help organize the icons in to groups according to their function. I don't have KDE install at my disposal right now (my Linux-install is hosed and waiting for re-install), but if the situation is similar in other KDE-apps, they should be modified accordingly as well. And the menus ARE too close together. There is plenty of room in the menubar, why cramp the menus so close together? Toolbars. Now, there's not much KDE could do in regards do third-party KDE-apps. But something could be done when it comes to the core KDE-apps. We should take a long and hard look at each app and get rid of the bloat. What could be done for example, is something similar to the "Actions"-button in the new Mac OS X Finder: Group the less used actions under a one button. Pushing that button shows a menu where those actions are listed. Of course, what's on that menu would be user-configurable. If we could move 4-6 actions that now have separate buttons in to that one menu, we could seriously reduce the clutter in the toolbars. Konqueror must get special attention in this regard, since it is THE KDE-app. Does the layout of the toolbar change when user switches profiles? Some actions that are relevant in filemanagement, may not be relevant in web-surfing. Having only relevant actions displayed in the toolbar would help. Now, it might be difficult to implement with tabs. If we have separate filemanagement-window and browsing-window, it wouldn't be difficult. But if they are in different tabs, it might be confusing to the user if the toolbar changes when they switch between tabs. I don't have an easy solution for this. That's it. Nothing more, nothing less. How about a file? That's it. It might be feasible to put "Actions"-menu in the desktop-menu as well. Configuration-options: This is a double-edged sword. Obviously we don't want to limit the tweakability of KDE. What we need to do is to re-arrange the control-cetner and consolidate, consolidate and consolidate some more. I can't really offer constructive opinions here, since it would require me to have up-to-date KDE installed. I will return to this subject after I have re-installed my Linux (that is, if people are interested in what I have to say). Why arn't Compress and Burn to CD in your Actions menu?